Super Ninety Nine is the favorite with 3/2 odds in the 2013 Rebel Stakes. 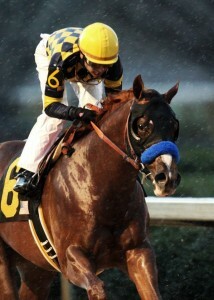 The 2013 Rebel Stakes takes place Saturday March 16 at Oaklawn Park in Hot Springs, Arkansas. Eleven powerful thoroughbreds are entered in the $600,000 tenth race of the day run on a 1 1/16 miles dirt track. The three-year-old winner of the 2013 Rebel Stakes will be awarded fifty points towards their entry into the 2013 Kentucky Derby. If either of the two Bob Baffert horses wins the 2013 Rebel Stakes, it will be the trainer’s fourth consecutive win. Bob Baffert has entered Super Ninety Nine, with 3/2 odds, and Den’s Legacy, with 8/1 odds, into the Kentucky Derby Championship Series Race. Experts predict that Super Ninety Nine is going to be the winner of the 2013 Rebel Stakes. Baffert’s Den’s Legacy is an extremely strong contender as well. I’m no expert but my picks are Carve, with 15/1 odds, Will Take Charge, with 15/1 odds, and Super Ninety Nine. I usually don’t pick Bob Baffert horses for very benign reasons but I’m definitely feeling Super Ninety Nine for Saturday’s Rebel Bull Stakes. Carve is currently undefeated in his two lifetime starts and both of those races were on dirt at 1 1/16 mile. This is Carve’s first stakes race, which makes him the new kid on the block! Will Take Charge is a D. Wayne Lukas trained horse. Lukas recently stated he was very pleased with Will Take Charge’s workouts and is excited to enter him in the 2013 Rebel Stakes. Post time for the 2013 Rebel Stakes is 6:48 PM EST and can be viewed on HRTV or TwinsspiresTV. Lady and The Track wishes all of the contenders the best of luck in the 2013 Rebel Stakes. Good Luck! Safe Run!